my god! you did a background! I refuse to believe that you cleaned up all the boxes in your living room. And what’s with the clothes? 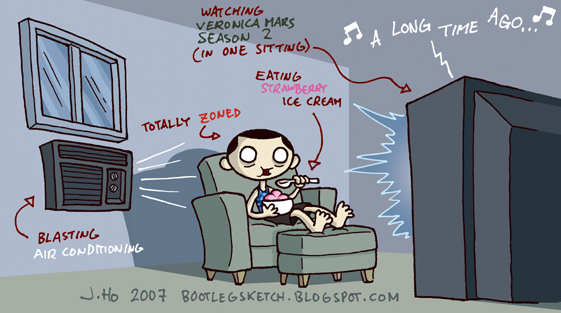 Watching VM, eating strawberry ice cream, blasting the AC and zoning out are all J.Ho nudist activities. lordshen: don’t get used to it. gavin: it’s an abstraction! i didn’t want to scare people away with an accurate depiction of me never wearing clothes in my apt.